Male ostriches in the wild, or in large domestic flocks, are often seen leading around a small group of females. The males are slightly larger than the females and darker in color. The male performs elaborate dancing displays, during mating season, trying to attract the female birds to mate with him. Mating season for ostriches takes place from April to September, with the chicks hatching during the months of October through December. Male ostriches undergo a color change at breeding season, when his skin turns bright red, which signals the hens that he's ready to mate. The male attracts as many hens as possible by dancing, fluffing his feathers, flapping his wings and swinging his head around while getting down on his knees. Often the females play hard to get and just walk away but the male doesn't give up and continues until the females succumb to him. The male ostrich is normally a silent bird. During the breeding season, he finds his voice and makes loud, hollow-sounding booms to attract hens. This vocalizing, along with his strutting and dancing, is what makes the hens become attracted to him rather than to the other males in the area. The loudest voice, and the fanciest dancing technique is what makes him a successful breeder and also attracts more females to his harem. The female ostrich holds her wings out from her sides, shaking the tips. She bobs her head, holding it low while opening and closing her beak. She crouches, telling the male she's ready. He approaches her with a rapid footwork dance and then mounts her while crouching with one foot on the ground and the other on her back. While mating, the male groans and the female snaps her beak and shakes her head. 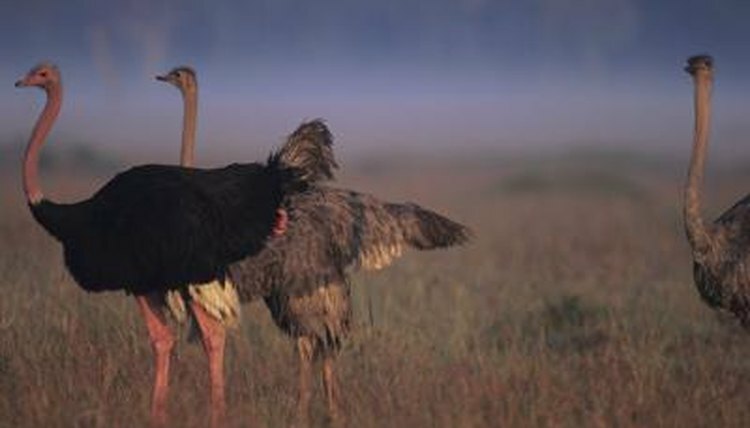 Ostrich males are not monogamous during breeding, but do give more careful consideration to the dominant hen who also is called the major hen. This hen gets first choice of nesting grounds, lays her eggs first, then allows the other females in the flock to lay their eggs. The major hen knows which eggs are hers and protects them by pushing away the eggs of other hens so those eggs are more likely to get eaten by predators.